Do you laugh when critics and reviewers talk about the 'logical successor' to an artist? Mercury Rising features a young Rain Man. 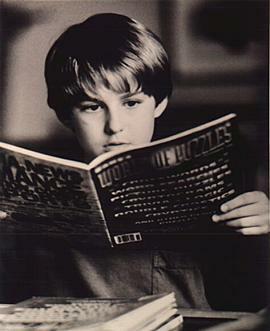 Miko Hughes plays a high-functioning autistic child with complete commitment, his performance setting a standard for the adult actors (Dustin Hoffman played the autistic adult in Rain Man). Hughes nine-year-old character is a savant who breaks the NSA's supercode when it appears in a geek puzzle book. His call on the puzzle line starts a series of events that leaves him an orphan hiding on the streets of Chicago with maverick FBI agent Art Jeffries (Bruce Willis). The premise is simple, the story arc is standard Hollywood, but the characterisation is strong, and the audience are carried through from beginning to end without a single mis-step. The gunshots and bare-fisted blows have the deep resonant sound of a martial arts movie, and the blood flows freely, but as Terry points out, we are given a chance to meet the people and learn to care about them, and more importantly, Art cares, and he is our representative in this film. Willis is great when he's dealing with authority figures whose balls are bigger than their brains. He radiates desperation, incredulity and anger, taking our viewpoint on such fools to the max.